While Max and Fish are off bustin’ wheelies on domestic-exotic hardware like the Alta SMs the good folks at BMW / Alta of San Francisco had to poor judgement to leave in our hands, I’m generally workin’ hard to maintain my reputation as utili-commuter guy. 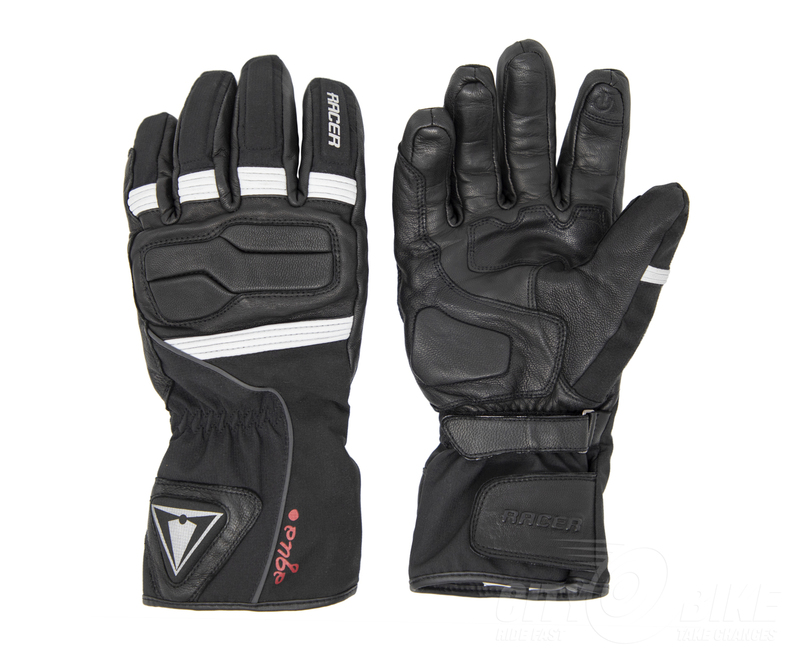 So I get to review Racer’s new Tour FHH gloves. Sure, the Racer brand sounds exciting and hotsy-totsy, but Tour sounds decidedly like something a guy whose compatriots refer to as Editor GS Aerostich would wear. You might think I mean these are boring gloves, but hell no, I do not—not at all. They’re nearly perfect Bay Area winter gloves, which is pretty goddamn exciting if, like me, you ride your motorcycle ‘round and about town all winter long. “Winter,” that is, as we get it here, which generally means temps that make riders in other states chuckle at our idea of cold, while their bikes are winterized and packed away somewhere safe from the clutches of winter and / or good times. Yeah, yeah, it’s actually cold there. But we get to ride. Guess what… we win. So about these gloves… what makes ‘em “nearly perfect Bay Area winter gloves?” In short, they’re comfortable, well-made, they fit well and offer a nice level of dexterity, and get this—they’re reasonably priced, just $109.99. Are you out of your mind?! FHH means “for heated handle grips.” The Tours have six ounce Dexfil insulation on the top portion of the hand but only two ounce Dexfil on the palm, meaning you’re insulated against wind on the top, while your heated grips—you do have heated grips, don’t you son?—can impart their wonderful warmth right to your paws with minimal interference. Sounds good, right? It is good. These babies let a lot of heat through—meaning that unlike with other gloves, I actually can’t run the grips on my GS on high for very long. They’re too hot! I wasn’t able to find the lower limit of comfort on the Tours in my general riding over the last month. What I did find is that behind the stock handguards on my GS, they’re good for about an hour of high-speed riding in the low fifties, maybe high forties, before I start to feel a bit of chill in some of my fingers: usually the pointer and middle on my right hand, which are extended to cover the front brake, and the middle finger on my left hand, because I ride with that one pre-extended in case I need to wave it at someone. Which I always do. Simmer down, I’m just kidding about that last bit. Also, you’re number one. Anyway, back to the gloves. With handguards and heated grips on, I think these would easily serve well into the low forties. Maybe not all day long without discomfort, but certainly for Bay Area commutes or winter run out Mines and back. I rarely felt much more than a bit of coolness in the Tours, and when I did, I just turned on the heated grips to warm things back up for a bit. Aesthetically, the Tours are good for retrogrouches (like me!) but if you like your gloves with titanium and carbon fiber and other junk all over ‘em, you may find the Tours to be a little too conservative. They come in black, with white accents on the fingers and back of the hand, and that’s it. No Rossi green, or high-vis puke, or whatever that color is called. There’s padding on the tops of the first three fingers, on the back of the knuckles, on the heel of the hand, and on the gauntlet a little further back than the little knobby on the outside of the wrist. That last bit of padding is oddly placed—I’d prefer the protection to be situated over the wrist-knob, but then I don’t ever crash, so it’s cool. Based on my measurements (eyeballing it), I’d put the glove at 63% leather, 37% textile—all on the back and cuff. The palms are goatskin. Presumably a big part of the reason these gloves are so reasonably priced is they use a AquaPoint waterproof / breathable membrane instead of Gore-Tex. Although I didn’t get to ride in anything wetter than heavy fog and light showers, waterproofiness seems good. My hands stayed dry. This is a personal thing, but the fit of the Tours on my hands is almost custom, as if they were made specifically for me. The sizing in Racer’s sizing chart runs small, but the measurements are accurate—I tend to be an XL, but the XXL Tours fit me, well, like a glove. The gloves are held on by a Velcro wrist strap, and there’s another Velcro closure on each medium-length cuff. Depending on the bulk of your jacket sleeves, I think these would work in or outside of sleeves—I wear them inside my sleeves and they fit easily and comfortably. The tip of each pointer finger includes a leather patch with a power symbol on it, indicating touchscreen friendliness. In my experience, this works with the screen itself, but did not work with the “soft” home button of my iPhone 7+. But that’s a moot point for me—I’m most concerned with whether the gloves can keep my hands warm and dry, without sacrificing dexterity. The Tours deliver very well in these key areas, and do so with understated, elegant style at a very reasonable price. $109.99. 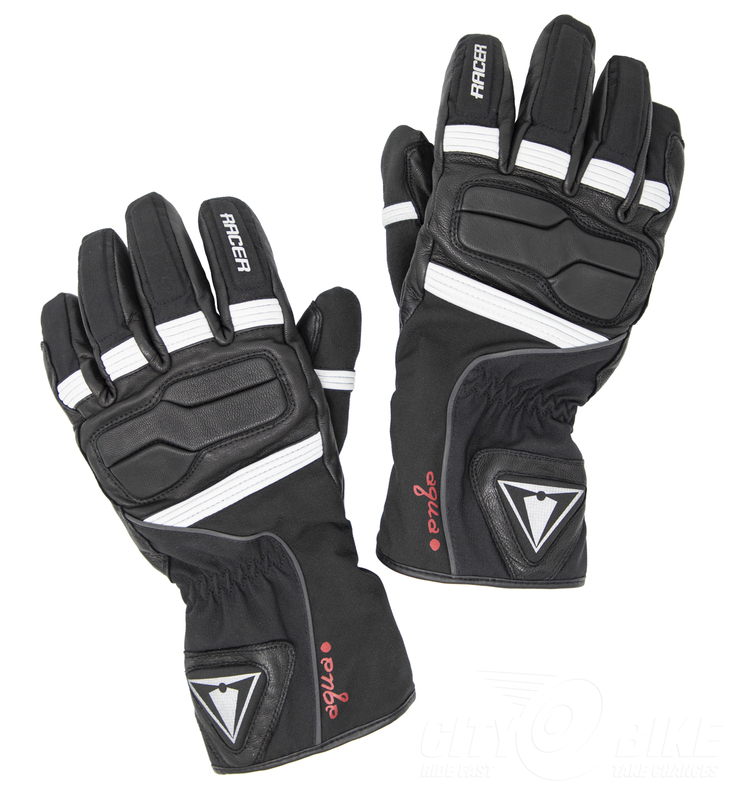 Get some at RacerGlovesUSA.com.